A woman who invited US President Barack Obama to her home in Cuba has received a response from the president, as direct mail links between the two countries were restored. 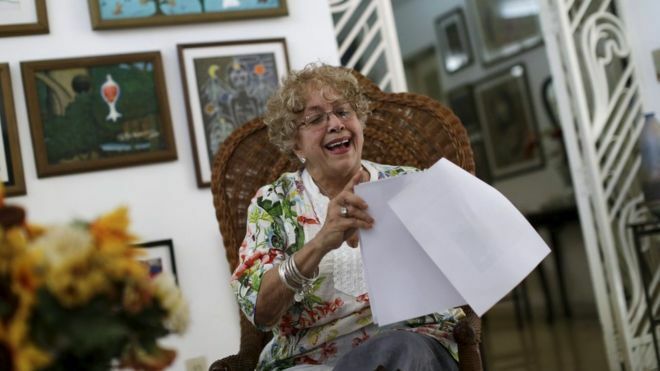 Ileana Yarza, 76, wrote to Mr Obama in February, inviting him to have "a cup of Cuban coffee" at her home in Havana. The president's letter, thanking Ms Yarza, was dispatched to Cuba on Wednesday. It was among the first batch of letters to reach Cuba from the US in 50 years. Direct postal service between the two countries was suspended at the height of the Cold War, meaning mail was re-routed through other countries - usually Mexico or Canada. Ms Yarza wrote to Mr Obama on 18 February after finding out he would be visiting Cuba in March, telling him: "There are not many Cubans so eager as I to meet you in person." The president thanked Ms Yarza for her support, adding that the letter "serves as a reminder of a bright new chapter in the relationship between [their] two nations. And he didn't rule out a cup of coffee - telling Ms Yarza he hoped he would have time. Speaking to the Associated Press, Ms Yarza said she had written to the president four or five times since his first presidential campaign and was "pleasantly surprised" by his response. In December 2015, the US and Cuba agreed to restore a direct postal service as part of the rapprochement process announced by presidents Barack Obama and Raul Castro. But despite developments in US-Cuba relations, Mr Obama has been unable to lift the trade embargo imposed in the 1960s, with Congress continuing to block it."